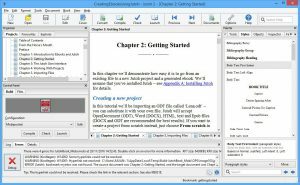 Jutoh is software for Windows, macOS and Linux that lets you edit and publish your book to any ebook distributor. You can import your book from a Word, OpenDocument or Epub file, or write it from scratch in Jutoh. Compile it to a Kindle or Epub file for upload to Amazon, Kobo, Barnes & Noble, Apple, or an aggregator such as Smashwords or Draft2Digital. You can also use it to prepare the content of a print book. Why do I need Jutoh? Jutoh doesn’t just convert your book from a word processor file – it lets you edit it, adding text, pictures, formatting and more. It also acts as a powerful checking tool, telling you where formatting and structure have problems so you can correct them before publishing. There are many help topics linked from Jutoh’s messages and available via the search facilities – think of Jutoh as your own digital publishing guru, backed up by Anthemion’s highly-praised email support. For power users, Jutoh lets you compile different versions of your book for different markets. You can add ‘conditional content‘ so your readers can follow appropriate links for where they originally bought the book. Or you can create a sample, just by switching to a different configuration and pressing Compile. Jutoh can create a multi-level table of contents, aphabetical index, footnotes or endnotes, and even a bibliography from a built-in database of references. There are many other tools to help you craft your book. Try out the demo which lets you test all the features before purchase; and check out the quick video of Jutoh in action below, showing how to import, compile and view a book.